It’s a moose! It’s a man! It’s the star of the weird little film festival returning to tiny Bicknell, Utah. 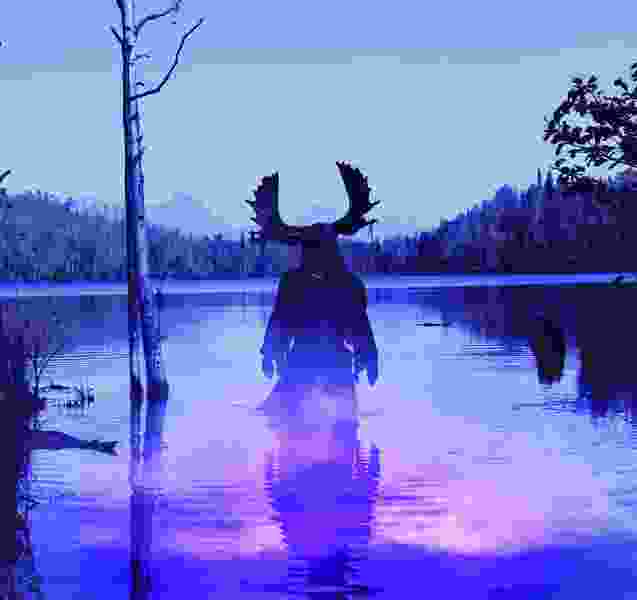 (photo courtesy Sons of Winter Productions) The Moosetaur, the mysterious beast at the heart of the horror-comedy "Moose: The Movie," which will screen at the Bicknell International Film Festival in Bicknell, Utah, on July 27. Carpenter, who writes the syndicated comic strip “Tundra,” decided to fix that by writing and producing a movie made in and about Alaska. Thus was born “Moose: The Movie,” a horror-comedy that will open the weirdest little film festival in America, the Bicknell International Film Festival. The festival, running July 27 and 28, is a celebration of bad B-movies that launched in 1996 in Bicknell, a central Utah town of more than 300 residents just west of Capitol Reef National Park. The festival has been on hiatus since 2013, but is returning thanks to a local arts organization and the owners of a recently renovated theater. The Entrada Institute is reviving the festival at the Bicknell Theater, 11 E. Main St. in Bicknell, on State Route 24 — about a three-hour drive from downtown Salt Lake City. “Moose: The Movie,” which will open the festival, is “Scooby-Doo on steroids,” said Carpenter. The idea for “Moose: The Movie” came to Carpenter on a six-hour drive from Fairbanks to his hometown of Wasilla — the city that once elected as mayor Sarah Palin, later Alaska’s governor and John McCain’s 2008 running mate. After the Carpenters wrote the screenplay, Chad Carpenter said, “I wanted to put some money into it.” A crowd-funding campaign raised about $65,000, and that “pretty much forced me to make the movie at that point, because I promised all these people we would,” he said. Carpenter raised an additional $40,000 to make the total budget more than $100,000 — impressive for a no-name indie, but nothing compared with Hollywood budgets. “You can’t even wax Brad Pitt’s legs for $100,000,” Carpenter said. Most of the cast and crew, from director G. Logan Dellinger on down, are from Alaska. Filming took place over 50 days and was harder than Carpenter thought it would be. “I don’t think I had any gray hair when we started,” he said. 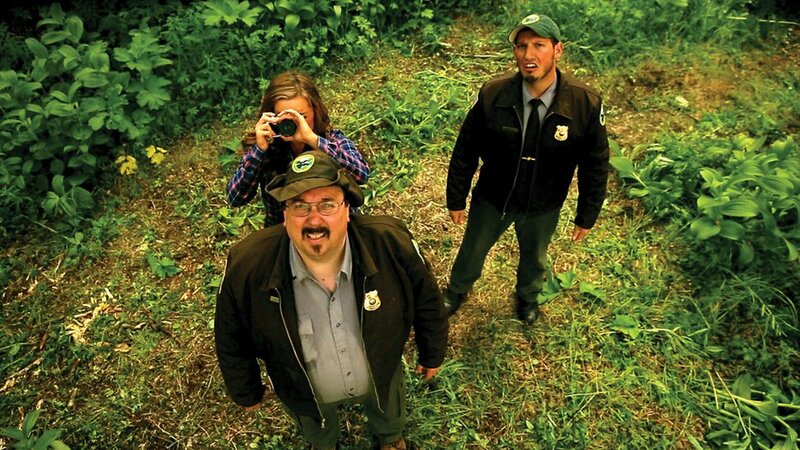 (photo courtesy Sons of Winter Productions) Rangers Mike (Dave Nufer, left) and Zack (Zack Lanphier, right), along with coroner's assistant Samantha (Chantel Grover, with camera) find a shocking discovery in the Alaska-made horror-comedy "Moose: The Movie." The movie will open the 2018 Bicknell International Film Festival, on July 27. The effort paid off. The movie debuted in a local theater in Wasilla, and what was supposed to be a 10-day run stretched to six weeks. A national theater chain picked it up and played it in other theaters in Alaska and about 20 screens in the lower 48. Then it came out on DVD, and “we broke even in about eight months,” Carpenter said. Gomes heard about Carpenter’s movie and thought it would be a perfect fit for Bicknell. “That’s exactly where ‘Moose: The Movie’ would thrive,” Gomes said. Continuing the Alaska theme, the festival’s closing-night film is the 1960 adventure “North to Alaska,” which stars John Wayne and Stewart Granger as Sam and George, partners on an Alaskan gold claim in the 1890s. Sam goes to Seattle to retrieve George’s French fiancée, but finds the woman has already married someone else. So Sam brings back a substitute, a dance-hall girl nicknamed Angel (played by the French beauty Capucine), who falls for Sam. Further complicating the story are George’s kid brother Billy (played by the teen idol Fabian), who develops a crush on Angel, and Frankie (played by comedian Ernie Kovacs), a con man with designs on Sam and George’s claim. (courtesy photo) A poster for the 1960 adventure "North to Alaska," starring John Wayne. The movie will close the 2018 Bicknell International Film Festival. 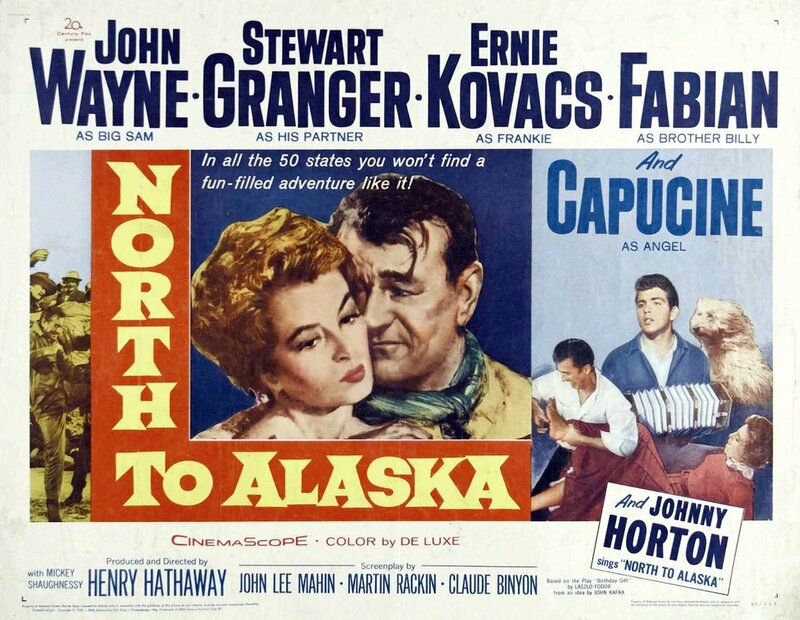 Though made only a year after Alaska achieved statehood, “North to Alaska” was filmed mostly in California. The revived festival, Gomes said, will have an Alaskan-themed caravan on the 8 miles of highway from Torrey to Bicknell — but, because of permit requirements, they aren’t calling it a parade. (photo courtesy the Bicknell Theater) The exterior of the renovated Bicknell Theater, in Bicknell, Utah. The theater will play host to the 2018 Bicknell International Film Festival, July 27-28, 2018. The Brill family had operated the theater, then called the Wayne Theatre (for Wayne County, where Bicknell sits), under the previous ownership. The theater was then open only on Friday and Saturday evenings, drawing locals and some tourists visiting Capitol Reef. After a year running the theater, the Brill family acquired it, and the renovations began. His wife, Kalynn, and their five kids all chipped in, he said. (photo courtesy the Bicknell Theater) The concessions area of the Bicknell Theater, in Bicknell, Utah, is a cafe that serves grilled sandwiches, finger food, shakes, smoothies and ice cream. The theater will play host to the 2018 Bicknell International Film Festival, July 27-28, 2018. The Bicknell festival fits in with Brill’s mission when he reopened the theater. “It’s fun seeing people come in with a smile and leaving with a smile,” he said. Carpenter is thrilled that the Bicknell festival is bringing his weird bit of Alaska to the lower 48. “I’m glad to be co-headlining with John Wayne,” he said. The return of the event that celebrates cheesy B-movies. Where • The Bicknell Theater, 11 E. Main St., Bicknell, on State Road 24 — about 8 miles west of Capitol Reef National Park and about 200 miles south of Salt Lake City. When • Friday and Saturday, July 27-28. Tickets • $10 per screening, at the door. Tickets for the Friday and Saturday night parties will be available at the theater. Friday events • Caravan gathers at 6 p.m. at The Saddlery, 450 W. Main, Torrey; opening film, “Moose: The Movie,” starts at 7 p.m. at the Bicknell Theater; after party is at the Rim Rock Inn, 2523 Highway 24 East, Torrey, with music by The Sister Wives. Saturday events • Closing film, “North to Alaska,” starts at 7 p.m. at the Bicknell Theater; after-party is at The Saddlery.